7 moves to strengthen your upper and lower body. Body weight exercises can make up some of the best strengthening routines when you use good technique and a little creativity. Below is a 15 minute workout that strengthens the major muscle groups while working on balance and functional strength (strength that you'll use every day). 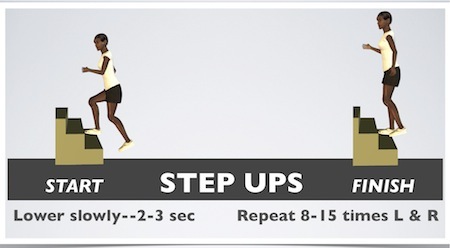 Instructions for each exercise are below, including 5 one minute videos. For the best results with this routine: Keep your maximum effort level at vigorous to hard (6-7/10) until you are familiar with all the moves. More on exercise effort for strength training here. Follow the instructions below closely--it may take a couple workouts to learn correct technique. 2) As you lower toward the bottom of the pull up (arms straight), let your knee bend. Then pull up, straightening your knee, until your chin is over the bar and the bar is in line with your collarbones. 3) Try for less weight on your foot each time you exercise. Once it becomes easy to do pull ups on 1 foot, try standard (unsupported) pull ups. 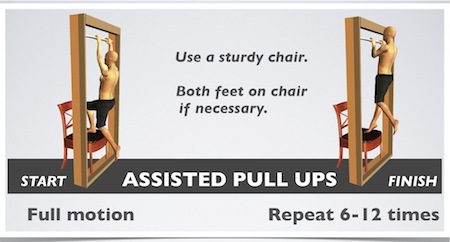 *Yes, you will need a pull up bar at home or access to a neighborhood playground for this exercise. It is worth your effort! This is one of the best body weight exercises for the upper body. Alternative: Have a partner hold one ankle (with both hands) during the pull up. Push your foot down into their hands as needed to help with the exercise. 1) Lean against an exercise ball so that your waist is against the center of the ball. Step your feet out from the ball about 18”. Then lower yourself down into a squat. 2) Slowly return to the start position. 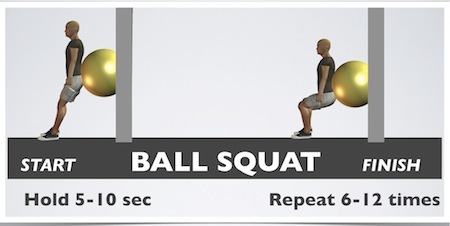 Squat more deeply to make the exercise more difficult, or straighten your legs somewhat to make it easier. This exercise can also be done without the ball behind your back. Stand with your back on the wall instead. 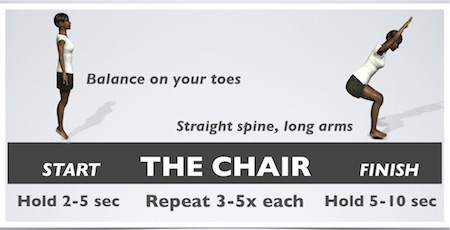 Adjusting the workout: Does one or more of these body weight exercises feel too easy for you? If so, first be sure you are doing the exercise correctly, through the full motion. Then you can increase the number of repetitions. If the routine is too difficult, do fewer repetitions. You can shorten the movement for #3, 6, and 7. #1 can be done lying on your side with an ankle weight instead. 1) Begin with your hands just outside of your shoulders. Keep your abdominals firm so that your stomach doesn't sag toward the floor. Keep your shoulder blades spaced wide on your back (instead of pinched together). 2) Lower your chest to within 3 inches of the floor. Push back up and repeat. 3) This exercise can be done on your toes if it’s easy on your knees. **Easier: Step onto a shorter step. Harder: Step up 2 steps at once. 2) From this position, bend your elbows and lower your head toward your hands, similar to a push up. Keep your back straight. Lower your self as far as you are able without strain and then return to the start position. 1) Stand with your knees and ankles touching. Bend at your waist, reach your arms overhead, and squat toward the floor. Maintain the arch in your lower back and try to reach your arms fully overhead. 2)Keep your knees behind your toes. As you improve with this exercise, try to drop your hips almost as low as your knees. 3) Next, go up on your toes as high as you can, keeping your knees and ankles touching and your arms at your sides. Lift your chest, straighten your arms and knees and hold this position before going back to #1. These body weight exercises can be used several ways in your weekly routine. 1) Go through the routine 2 times for a full day's workout. 2) Combine this routine with the back-core routine for total body strengthening. 3) Add this routine before or after your cardio workout. 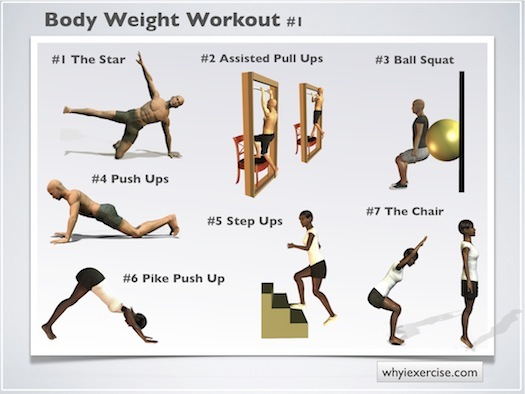 Return from body weight exercises to free home exercise programs. Return from body weight exercises to why I exercise.